I'm late finishing this week's challenge and then I noticed that I used Chainging instead of Punzel. Well I will post it anyway and give Punzel a try later. I made this challenge for my DH who turns 65 on November 1. 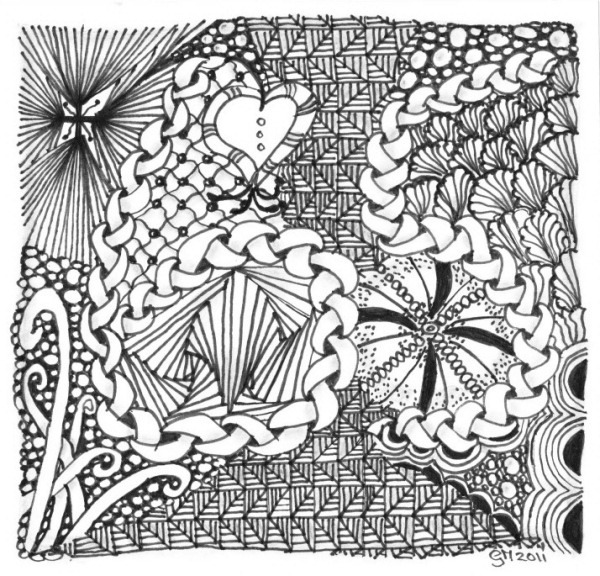 I thought this tangle was perfect to create numbers with. It's not finished yet. I think the numbers will show up more if I color it. Will do that later. Here is the tutorial for both Chainging and Punzel. very clever; it's like a puzzle where you look at something long enough you will find .....65! I'm sure Leroy will love the time you put into making a special card for him. Happy Birthday Leroy! Really Cool! It's so intricate and intriguing! My goodness, your lines and tangles are so precise and even - gorgeous work!